Marilyn Awong a returning resident to TT is calling for answers into the seizure of her vehicle and other personal items by the TT Customs and Excise Association after her return from the US in July. 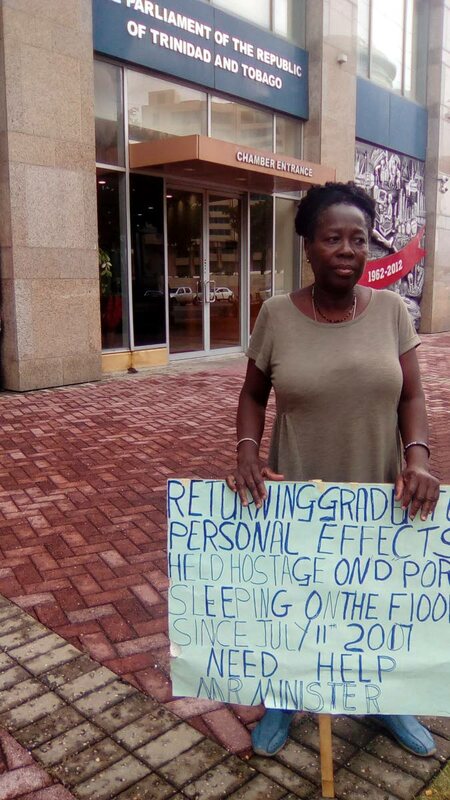 Researcher and retired nurse Marilyn Awong staged a livid one-woman protest outside Parliament at the International Waterfront Tower D yesterday against what she described as a grave disservice against her by the TT Customs and Excise Division. Awong returned to TT in July after completing research on behalf of the University of the West Indies (UWI) Faculty of Medical Sciences in the United States and expected her vehicle, furniture and other personal effects to be shipped shortly after her arrival, however, Awong was later informed by officials at the Customs and Excise Division that she overstayed her visit to the US by one month and her property would be kept at the port pending approval of documents. Awong said despite submitting a letter from the UWI Ethics committee in August, she has not received any feedback from the Customs and Excise Division on the state of her items and was last told that the release of her items would have to come after an approval from Cabinet. Newsday attempted to contact the Customs and Excise Division yesterday for comment but was unsuccessful. Reply to "Nurse protests at Parliament for vehicle, furniture"